Former President Goodluck Jonathan met with governors elected on the platform of the Peoples Democratic Party in Abuja over the lingering crisis in the former ruling party. The meeting was held at the office of the former President located at Maitama District. 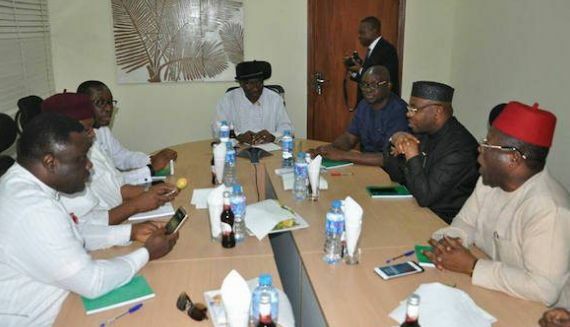 The governors were led to the meeting by chairman of their forum, Ayodele Fayose of Ekiti State. Others governors at the meeting were Ibrahim Dankwambo (Gombe); Okezie Ikpeazu (Abia); Dave Umahi (Ebonyi); Seriake Dickson(Bayelsa); Udom Emmanuel (Akwa Ibom); Darius Ishaku (Taraba); Ifeanyi Okowa (Delta); Ben Ayade (Cross River); and Ipalibo Baligo(Deputy Governor of Rivers State). At the end of the meeting, Fayose told reporters that the governors had decided to find a political solution to the crisis in the party. Fayose said, “It is my pleasure to tell you that we are here at the instance of the former President. He is genuinely concerned by what is going on in the party. And he thought that an interactive session with the governors would go a long way to douse the tension. “One, we want to assure all our supporters that we believe in this party. We believe in the success of this party. We want to appeal to everybody to be wary of making statements that could further worsen the situation. In his reaction, Sheriff said he's ready for peace of the governors are sincere. “It is a good news to hear that our governors have agreed to find a political solution to the crisis."